BOISE, Ida. – Today, in a sharply worded rebuke to the Bureau of Land Management (BLM), an administrative law judge granted Western Watersheds Project’s appeal of a 2013 grazing permit renewal decision that failed to protect sage-grouse on two public land allotments south of Ely, Nevada leased to the Southern Nevada Water Authority (SNWA). The Cottonwood and Scotty Meadows allotments both failed to meet rangeland health standards for wildlife habitat due to inadequate vegetation cover for nesting and brood-rearing for these ground-dwelling birds. 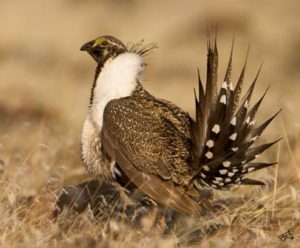 Despite failing land-health standards for sage grouse, the proposed extension of the livestock grazing leases would not improve the damaged sage-grouse habitat, according to BLM’s own analysis. The court order urges the agency to revisit grazing management while maintaining the slightly better standards of the overturned decision in the interim. When the BLM does reissue the grazing decision, it will have to conform to the amended sage-grouse resource management plan and adjust grazing accordingly. A copy of today’s decision can be found here.